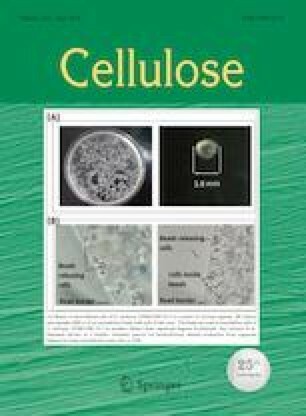 Development of a simple, green, and universal method for the fabrication of hydrophobic cellulosic materials is of significance for enlarging their applications. Herein, one-step gas–solid reaction for the preparation of hydrophobic cellulosic materials having any shape and size is proposed. The substance can be made hydrophobic, as it is fully exposed to the reactive organosilane vapor. Filter paper (FP), a typical cellulosic material, was selected to study the hydrophobic modification with perfluorooctyltriethoxysilane (PFTS). The results indicated that PFTS was successfully introduced onto the surface of the cellulose fiber. Compared with the pristine FP, the physicochemical properties of the PFTS-modified FP (SFP) were significantly improved. The silane content of SFP was approximately 45–55 mg g−1, and the water contact angle was as large as 146° ± 3° under the proper conditions. SFP retained good chemical stability in harsh conditions of acidic, alkaline and saline solutions that is appropriate in practical environment. It was successfully applied in separating a series of oil/water mixtures with a separation efficiency of over 99%. The flux and separation efficiency remained high even after 30 reuse cycles (99% for chloroform/water mixtures). Moreover, the proposed vapor-based technique has the potential to allow continuous preparation of hydrophobic cellulosic materials with industrial applications. Organosilane vapor-based surface modification is provided to fabricate the hydrophobic cellulosic materials with any shape and size, which has promise in industrial applications. The online version of this article ( https://doi.org/10.1007/s10570-019-02355-7) contains supplementary material, which is available to authorized users. This work was financially supported by National Natural Science Foundation of China (51473128 and 51273151).